The Corner-turning Gear Octahedron like a geared version of Trajber's Octahedron. The six vertex pieces and the twelve edge pieces are all eight-toothed gears. The triangular face centres are not geared. When you twist a vertex, the gears mesh so that the edges twist as you do a move. When the pieces have travelled around by a quarter turn, the edges have all twisted 5/8ths of a turn, and the vertex has twisted 7/8ths of a turn. This leaves 86·12!·812·8! / (2·2·8) = 10,872,446,393,440,151,739,039,744,000 or 1.09·1028 positions. The vertices are denoted by the letters L, R, F, B, U, D (Left, Right, Front, Back, Up and Down). Clockwise quarter turns are denoted by the appropriate letter, anti-clockwise turns by the letter followed by an apostrophe (e.g. L' means turn the Left vertex 90 degrees anti-clockwise). To indicate moves of more than a quarter turn, a number is added to show ho many quarter turns are done. For example F2 means a clockwise half turn of the Front vertex, and F'2 an anti-clockwise half turn. Phase 1: Solve vertex pieces. Rotate the F, B, L, R and U vertices so that the colours of the vertex pieces match each other. Remember to do complete moves, so that the face centres still lie at the centre of each face. The D vertex will be done later. Phase 2: Place the U edges correctly. First find any edge that belongs next to the U vertex but which is incorrectly positioned. Move FR to the D vertex: Do F D F'. Move UF to the D vertex: Do F2 D F'2. Move FL to the D vertex: Do F' D F.
Rotate D to place the piece at the right hand side, i.e. at DR. Put it in place by using the move sequence F2 D' F2. Repeat the above until all U edges are solved. Phase 3: Place middle edges correctly. Find an edge that belongs in the middle layer, but which is not in the correct position. If it lies in the middle layer (at the wrong location) then hold the puzzle so that it is at the FR location and do F D F' to put it next to the D vertex. Rotate D to bring the edge to the DR position. Insert the edge at FR by the sequence F D' F'. Repeat the above until all middle layer edges are solved. Phase 4: Solve last vertex piece. Turn the puzzle upside down so that the last vertex is at U.
Rotate U until the vertex piece matches the others. Phase 5: Solve the four U edges. The UF location: do nothing. Turn the whole puzzle to the left so that the solved UF piece now lies at the UL location. Repeat steps a-c for each of the edge pieces in turn so that they are all solved. The last edge piece should be automatically correct, because otherwise the puzzle has been disassembled or the gears have slipped past each other. Hold the puzzle so that there is an incorrect face centre at the DFR face, and so that the face where it belongs lies in the top half, and so that there is at least one other incorrect face centre in the top half as well. This is always possible if there are incorrect centres. 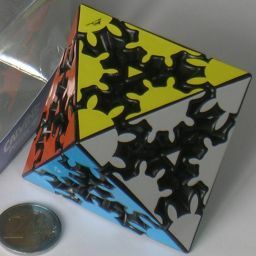 If there are only two incorrect centres, then the puzzle has been taken apart and reassembled incorrectly, or has been incorrectly re-stickered.